......... mononykus at a termitemound. I like it. It's interesting to see mononykus depicted as fulfilling a role similar to an anteater. I'd like to use this image for our book about dinosaurs. Could you please kindly guide me how to proceed it? Or, could you let me know your direct email address? Plz let me know your e-mail. Mononykus is a weird dinosaur with it's stubby arms. Nice job! 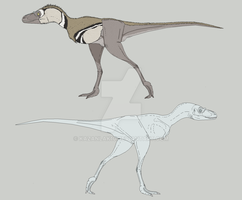 Oh yes Mononychus! A Mongolian bird-like dinosaur. i have tryed twice. no answer. maybe you can help me? Oh well, I think Mike Keesey is too busy. Better waiting then, I hope he'll be able to have a review system soon. because of become a member od the dinosauricon gallery. Excellent work. I must add it to my favorites! Just a suggestion: try to do the arms and claws a little smaller. They look a little large for me. The rest is simply perfect! maybe you are right. look now. (but dont forget the possibility of sexual dimorphism. das ist wirklich süß geworden... wobei ich den brütenden immer noch am besten finde, weil die federn da so klasse sind. gute zusammensetzung!... dieser hier und der vorige erscheinen mir allerdings unwirklicher als der brütende. kann mir die namen einfach nicht merken hoffe, das hilft trotzdem?